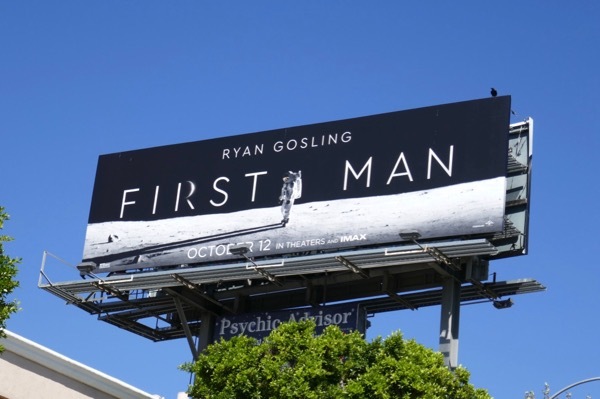 This October Ryan Gosling and director Damien Chazelle reunite to put a man on the moon. 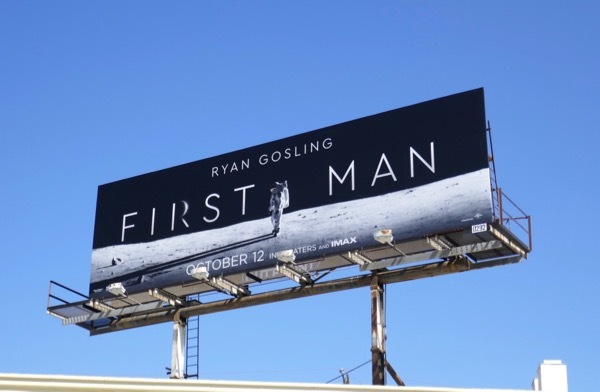 First Man sees the Whiplash and La La Land director, who is the youngest person to win the Oscar for Best Directing to date, chronicle the life of 'Neil Armstrong' and the historic race for humanity to walk on Earth's Moon. 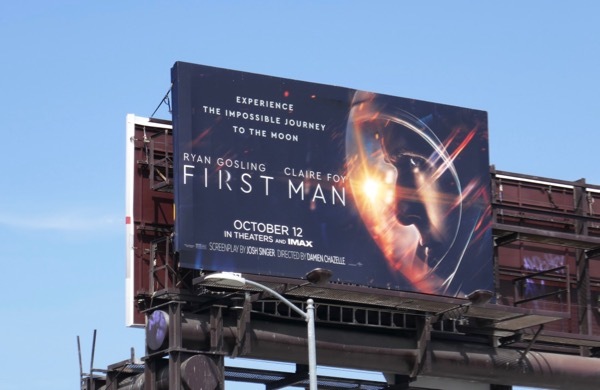 Ryan Gosling stars as the American astronaut and the picture follows the years leading up to the legendary Apollo 11 mission, with The Crown's Claire Foy playing his first wife, 'Janet Shearon'. 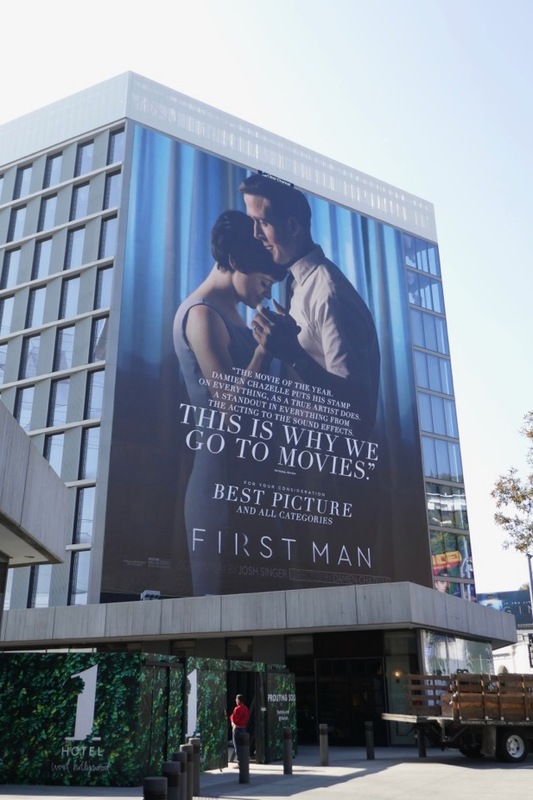 These iconic movie billboards were snapped along Beverly Boulevard, San Vicente Boulevard, Pico Boulevard, Westwood Boulevard and Highland Avenue from September 19 to September 29, 2018. 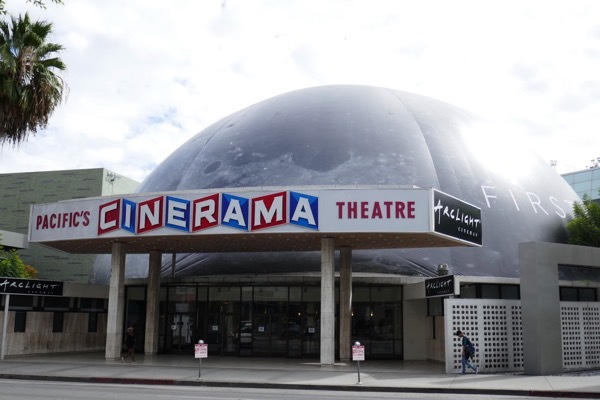 Plus for extra visibility Hollywood's iconic Cinerama Dome was wrapped in a facsimile of the Moon's surface to create some fun PR for the movie, as photographed along Sunset Boulevard on October 2, 2018. 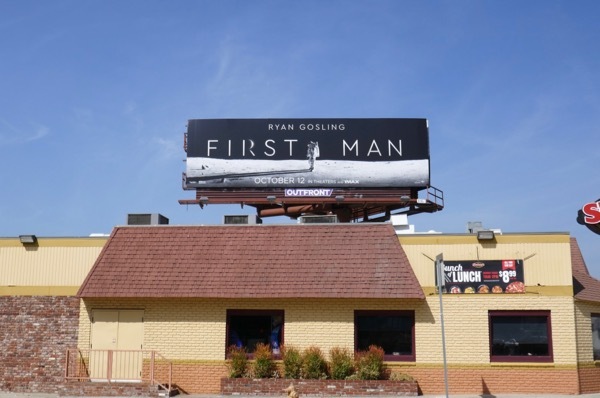 Fans of Ryan Gosling can also enjoy these La La Land movie billboards, these Blade Runner 2049 film billboards and these movie billboards for The Nice Guys, to name but a few. Only time will tell whether this impossible journey to the Moon on July 20, 1969, will land First Man at the Academy Awards this season. 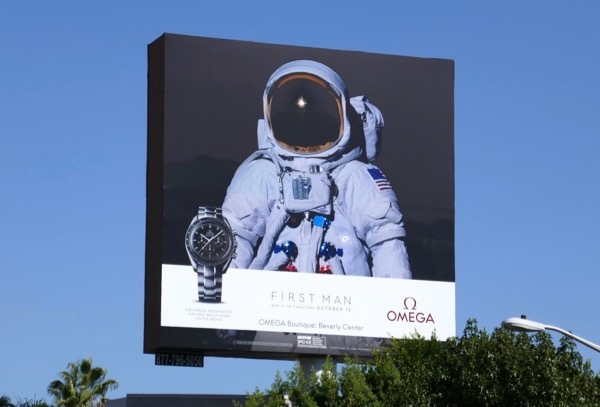 UPDATED: Here's also a promotional tie-in billboard for Omega timepieces, its Speedmaster the first watch worn on the moon. 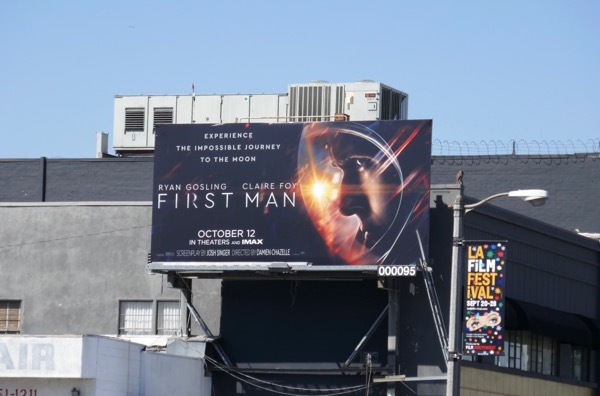 This astronaut billboard was spotted above the Sunset Strip on October 12, 2018. 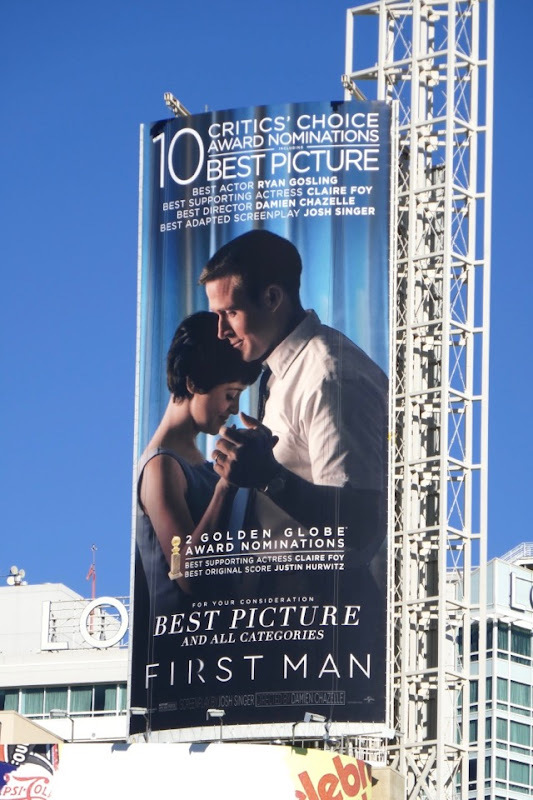 UPDATED: First Man may not have excited the box office the first time around, but maybe if the film garners some critical acclaim this awards season it may generate more appreciation for the biopic. 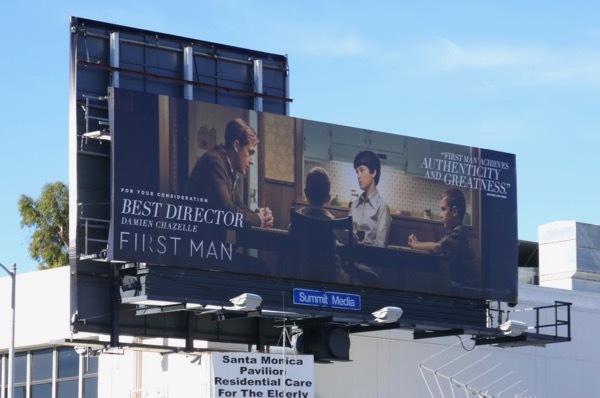 Let's see if this giant-sized 'For your consideration' billboard snapped on November 20, 2018, along the Sunset Strip does the trick. 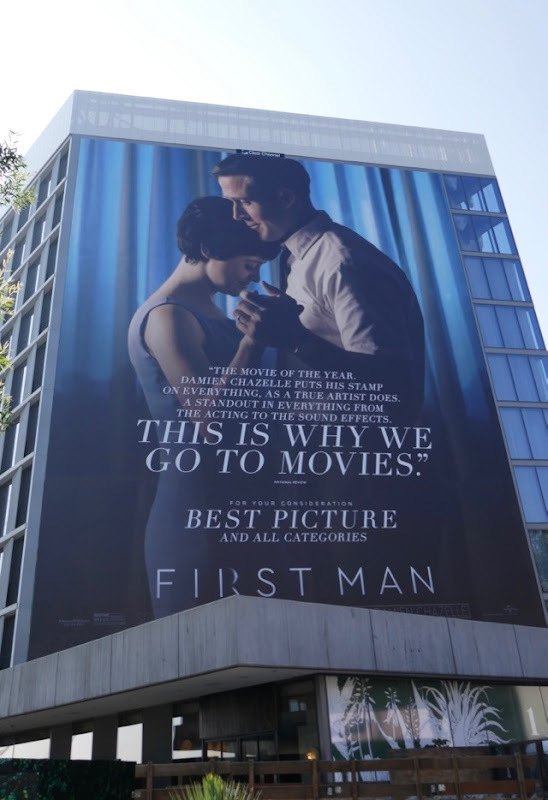 Plus here's a different FYC ad creative spied along Santa Monica Boulevard in West L.A. on November 26, 2018. UPDATED: Congratulations to First Man for receiving ten Critics' Choice Award and two Golden Globe nominations. This portrait version nominee and FYC billboard was spotted high over Hollywood & Highland on December 30, 2018. UPDATED: Congratulations to Justin Hurwitz for winning the Golden Globe for Best Original Score - Motion Picture, but now it's time to campaign for the Oscars. 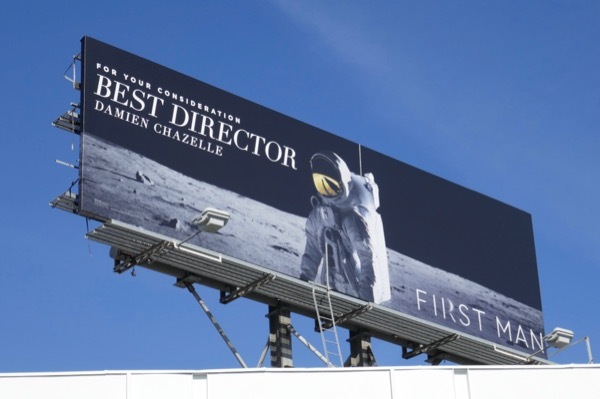 This 'For your consideration: Best Director' billboard for Damien Chazelle was spied high over Beverly Boulevard on January 9, 2019. Plus fans of the movie can also check out these spacesuits and props from First Man on display. 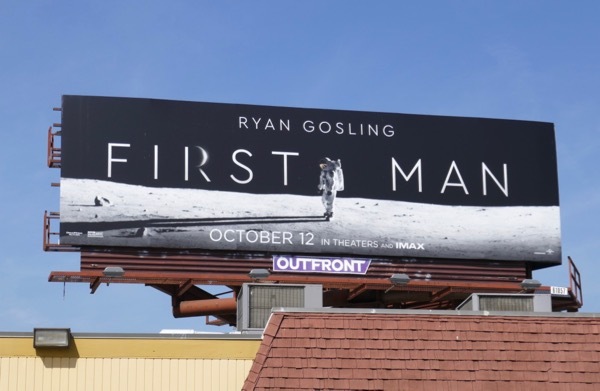 Are these First Man billboards still up if so where??? Thanks so much!!! 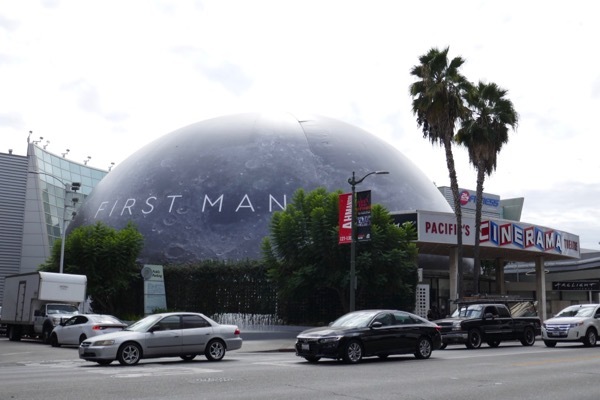 There are still some ads around town for First Man, just not sure if these are still there - the large landscape ones were at San Vicente and Fairfax am and above Pico Blvd at Beverwill Drive pm. Hope that helps! Jason thanks so much for the reply. Is this your blog?